Got an “ugly Christmas sweater party” coming up? I searched ALL OVER trying to find one from thrift shops, and could not for the life of me find one….so I made this one! It was actually very easy, and the supplies were mostly all things I had on hand. 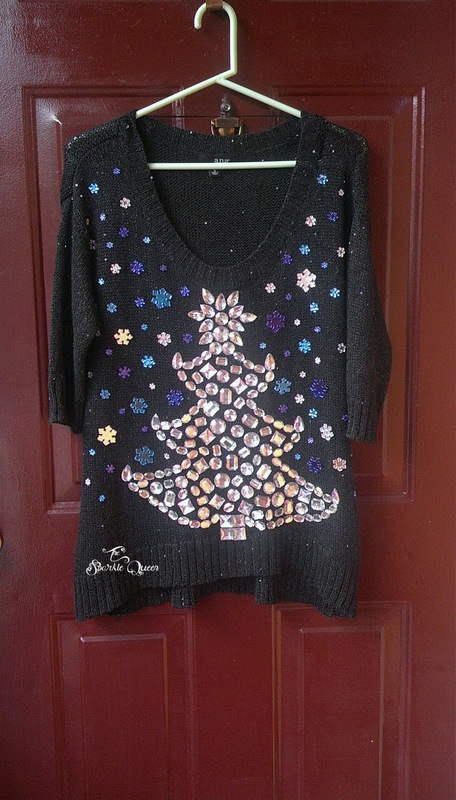 Really, all you need to make this is an old sweater, embellishments and glue. The rest is totally up to you! Also, here’s a sneak peak at the matching nails I did for it! More pics and a tutorial coming soon for them. So, how crazy would your tacky sweater get? Or would you be the one mumbling “bahumbug” and not sport one that night?